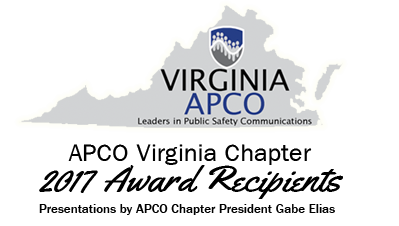 The Virginia Chapter of APCO is pleased to announce that Susan Clark has been named the Virginia Association of Public Safety Communications Officials Stephen Souder 2017 Telecommunicator of the Year. 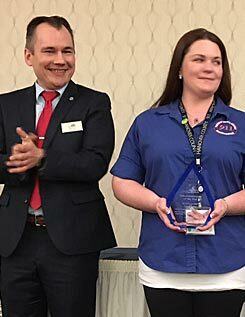 Susan, along with other award recipients listed below, was recognized and received her award in Virginia Beach during the 2018 Virginia NENA-APCO Spring Conference. We Proudly Recognize and Call to Your Attention the Outstanding Work of all the Telecommunications Professionals who were Nominated for the 2017 Telecommunicator Awards. Congratulations and Thanks for your Commitment and Dedication! Photos have been compressed and cropped for website presentation. If you need higher resolution and/or uncropped photos, contact the Webmaster.